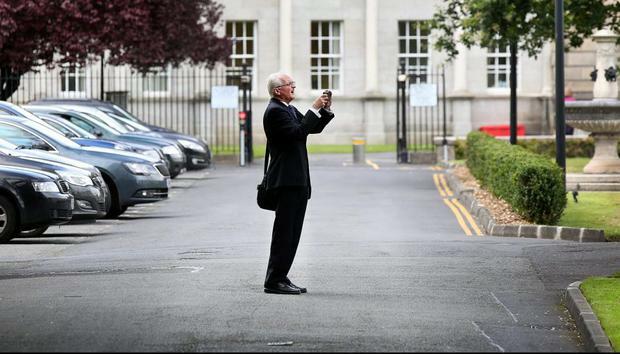 Former Green Party leader John Gormley takes a photo on his phone as he arrives at Leinster House yesterday. Photo: Steve Humphreys. There was no way that it wasn't going to come up, although John Gormley might have thought he was home and dry by the time it got to the final quizmaster of the afternoon's session of the Banking Inquiry. But there was no way that Joe Higgins was going to let him skate on one of the more memorable quotes of his turbulent term in power - not made by him, but addressed to him by the person sitting to his left, Mary Harney. "Can I ask you - was the worst day in government better than the best day in opposition? Was that a siren call or was it sound advice from a partner in government?" enquired Joe. He was referring to the buck-up text message sent by the veteran Progressive Democrat to the Green Party leader in the chaotic last months of the toppling coalition, when the Greens were running about like headless organic chickens, agonising about whether to remain in situ or pull the plug and put the coalition and the horrified country out of their respective misery. John Gormley wriggled in his seat. "I'd a funny feeling that was going to come up," he said wryly. "I remember Deputy Harney saying that to me, and I was absolutely mortified when it appeared in the newspaper," he said. "But it absolutely wasn't true - some of the worst days we ever had were when we were in government, and it was unimaginable. And just when you thought it couldn't get any worse, it did," he explained. And no one in the room doubted his sincerity. Anyone who witnessed at close quarters the final months of the Fianna Fáil-Green government remembered the permanently stricken expressions of the junior partners, as if they were trapped inside Bates Motel rather than ensconced in Government Buildings. Despite very few sightings of either Mary Harney or John Gormley since they both departed Leinster House, much was familiar about their respective performances at the Banking Inquiry. Looking relaxed and unworried (as well she might, given her generous pension after 34 years in the Oireachtas), the former Tánaiste gave her evidence and answered questions without elaboration or drama. John, however, was more eager to put out his side of the story in more detail and stress that there was damn-all the Greens - or anyone - could've done when the hammer dropped on the coalition and the IMF rode into town. "Nobody could have foreseen the collapse. We were forced to take the most unpalatable decisions," he appealed to Joe. "In an ideal world, if we could clone Joe Higgins and create 90 Joe Higgins and have a majority in government, you'd find that your options would be limited in a crisis like this. I wouldn't wish it on my worst enemy." The Dublin West TD paused to contemplate the heady spectacle of not being the only Socialist in the Dáil ever again. "I'm afraid I'm not in a space where I can debate that with you right now, Mr Gormley," Joe 90 regretted. But it transpired that John wasn't ploughing a lonely furrow in the bad times. He had economist David McWilliams to rely upon. The pair struck up quite a working relationship - bordering on a bromance - with emails flying back and forth. And David - who was famously pally with then-finance minister Brian Lenihan - was able to give Mr Gormley all sorts of insights into the mind of Brian in the period of time before the bank guarantee. "In fairness to David McWilliams, he didn't want to let me know the extent of his contact with Brian Lenihan," explained John. "The finance minister always played his cards close to his chest... I was hearing what he was thinking from David McWilliams". Who knew such a bromance had blossomed? They had met on the corridors of power, and John judged David had called the looming bust correctly, unlike most economists. "I found him to be engaging, personable, quite enthusiastic." Mary Harney hadn't been quite so bowled over. "Mr McWilliams wasn't in touch with me in the same way that he was in touch with Mr Gormley, and I hadn't recognised in this meeting the extent of that engagement," she said drily. John was also asked why he hadn't left Sandymount and gone into Government Buildings on the night of the bank guarantee. "I was in Ringsend," interjected John anxiously. Oh, well, that makes all the difference in the world, then.